The characters on the tag are a little difficult to make out in the picture, so I have reprinted them below. AQ9 = Recaro/Lear Siegler Seats? While researching the RPO codes I found a great resource compiled by wildjeff on www.82firebird.com. It is a guide to 1982-84 Pontiac Firebird Decoding which includes information on production numbers, options breakouts, VIN, Body Plate, paint codes, trim codes, trim code figure, engine codes, transmission codes, rear axle codes, RPO codes and wheels. The only RPO code I was not entirely clear on was AQ9. This was listed as Recaro Seats. 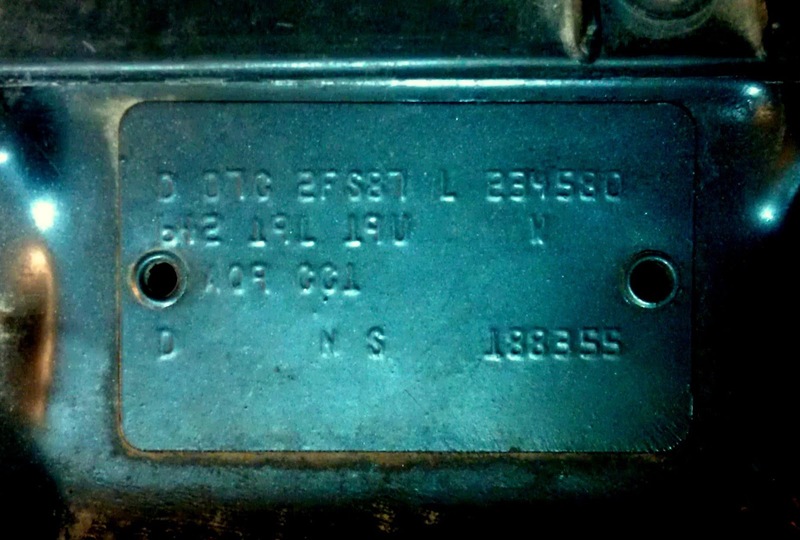 My Trans Am has the Lear Siegler seats, but I do not see a separate RPO code for them. I am assuming until I find out otherwise that the Recaro and Lear Siegler seats shared the same code. The only way I am going to find out any more information about the history of my Trans Am is to find the elusive build sheet. I have not begun looking in the car's interior yet, but plan to do so soon. This post is really cool - thanks for sharing that information. Very nice blog you have going on here. Thank you and thanks for following Project: K.I.T.T. !